The Lynch Brothers, Charles, James, George, Newton and Samuel, sons of William H and Susan Kelly Lynch, grew up in the Keenan area of Monroe County along with two sisters, Nancy and Mary. 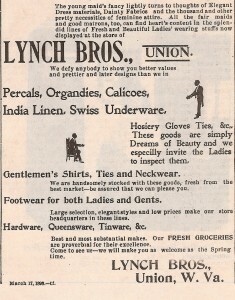 The five brothers became the proprietors of the Lynch Brothers mercantile store in Union in the late 1800’s. 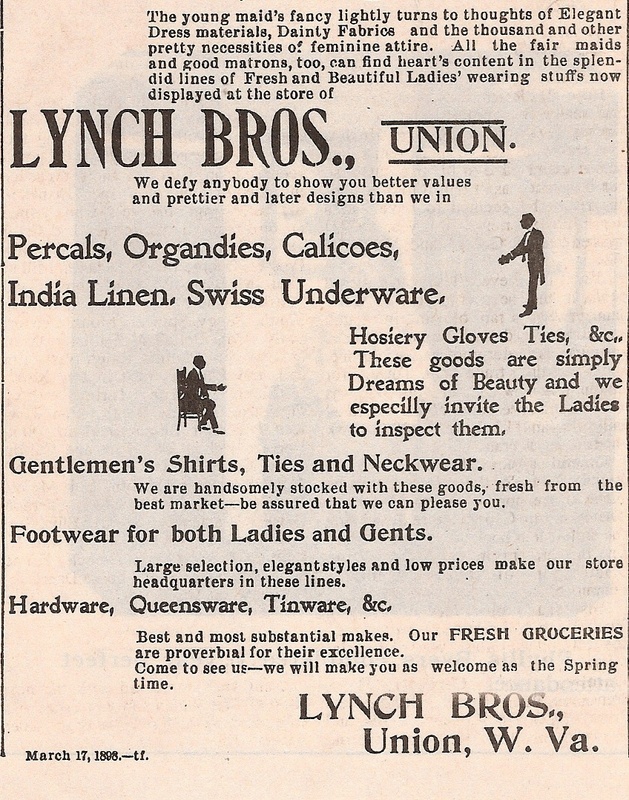 Later on one brother, Newton Keenan Lynch became the sole owner of the store. Many trips were made by horse and wagon to Fort Spring to the railway freight station to pick up dry goods and other supplies for the store. In 1898, Newton “Newt” Lynch became engaged to Grace Meador. She came to Pickaway to live with her Aunt and Uncle following her mother’s death. She married Newton Lynch and they had two children, a son, Elwyn Lynch born in 1901 and a daughter, Virginia Lynch (Gwynn) born in 1902. 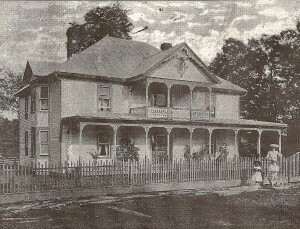 The family lived in the house on the corner of Main Street in Union next door to the United Methodist Church. Newton Lynch died at an early age of 54. The family closed the store a few years after his death. The children of Elwyn Lynch are: Nancy Lynch Lightner (UHS Class of 1961) Bill Lynch (UHS Class of 1966), Ruth Lynch (UHS Class of 1968) and Kathy Lynch (UHS Class of 1976). 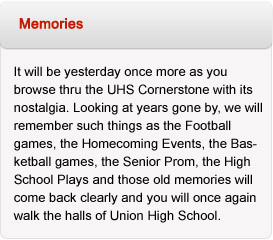 The children of Virginia Lynch Gwynn are: Jean Gwynn Miller (UHS Class of 1951) and Sonny Gwynn (UHS Class of 1947). The Newton Lynch home – Virginia and Elwyn Lynch, children of Newton and Grace Lynch are pictured in front of the fence. The advertisement and picture was taken from the Monroe Watchman.